The long train of Sand Springs 2015-2016 Championship appearances has led from softball to cross country to dance to football to dual state, and now it's stationed at Oklahoma State Fair Arena in Oklahoma City where the Sandites sent ten qualifiers for one of their best performances in years. The wrestlers may not have pulled off their first team championship since 1971, but they have undoubtedly shown themselves strong in the great tradition of Sandite athletic excellence. Going into the tournament Sand Springs held 35 individual State titles from 25 champions. The likelihood of adding to that number was strong as they brought six Regional Champions and one returning State Champion in Daton Fix. 106 pound freshman Riley Weir (21-12), 113 pound junior Michael Ritchey (24-12), and 170 pound senior Trace Fleischman (10-6) were eliminated without placing. Sophomore Payton Scott (19-6) came in fourth place in 152 after an upset by Westmoore's Trey Painter whom he initially defeated in round one of the tournament. The two went into a tie breaker round where Painter came on top with a 3-2 decision. Sophomore Blake Sargent (39-12) came in third at 120, scoring first with an escape midway through the second period against Zackery Bibb of Capitol Hill. Bibb tied it up moments into the third. The two remained neutral through the third, the sudden victory round, and the first tie breaker. In the second tie breaker round Sargent got the escape and the 2-1 victory. Bibb had initially defeated Sargent in round one. 160 pound Junior Zane Basma (35-12) came in third after taking a quick lead by takedown and near fall less than a minute in to his match against Enid's Anthony Gonzalez. He added another takedown for near fall points moments into the third for a 9-0 lead and ultimately triumphed with a 16-0 tech fall in 4:32. 132 pound junior Jack Karstetter (39-8) settled for State Runner Up after a narrow 3-2 decision to Kruz Simons of Edmond North. Simons scored first with a first period takedown with only 18 seconds left. Karstetter added a quick escape to start the second, then cut Simons loose a minute into the third after efforts at a pin proved fruitless. Unfortunately he was unable to find the takedown. 138 pound junior Beau Bratcher (43-7) came in second to Jaxen Gilmore of Yukon. Bratcher scored first with a quick takedown but Gilmore was right behind him with a reversal for near fall points to end the first period. Gilmore added another reversal with 40 left in the second and took a 7-2 lead into the final period where he pinned the Sandite in 4:52. Junior Daton Fix (45-0) secured his third consecutive undefeated State Championship with a 23-8 tech fall over fellow Fargo Champion Dalton Duffield of Westmoore in 4:58. Fix made it through the match without giving up a single takedown or reversal. 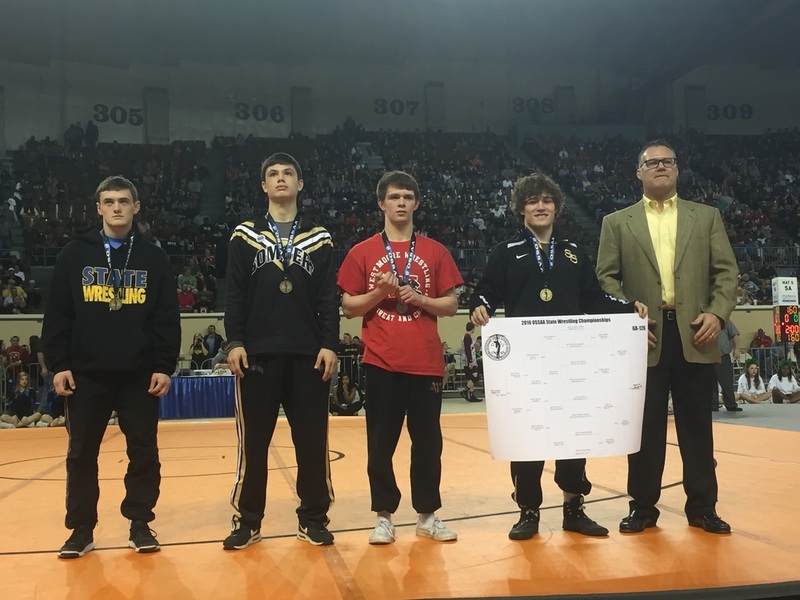 Fix is now only the second Sandite ever to win three State Championships, following in the path of David McGuire who won three from 1963-1965. This is Sand Springs's 36th individual State Championship and the first time since 1979 that the Sandites have brought home a gold medal three years in a row.